Enid Hunkeler, MA, is an emeritus research scientist at the Kaiser Permanente Northern California Division of Research. 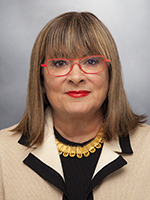 Her research interests include the development, implementation and dissemination of innovative models of care for depression, bipolar disorder, behavioral health, violence prevention (both community and domestic); and Internet-based programs for bipolar disorder, depression, diabetes and hypertension. She is also interested in issues related to suicide. Ms. Hunkeler has authored or co-authored more than fifty articles and book chapters. Author(s): Lu CY; Hunkeler EM; Kulldorff M; et al. JAMA Psychiatry. 2018 Jan 31. Am J Psychiatry. 2018 Jan 24:appiajp201717080844. Ann Epidemiol. 2016 Feb 4. J Gen Intern Med. 2014 Jun;29(6):870-7. Epub 2014-02-25. Pharmacoepidemiol Drug Saf. 2014 Feb;23(2):218-20. Use of antipsychotic medications in pediatric populations: what do the data say? Curr Psychiatry Rep. 2013 Dec;15(12):426. Does gender moderate the relationship between childhood maltreatment and adult depression? Child Maltreat. 2011 Aug;16(3):175-83. Epub 2011 Jul 4. Gen Hosp Psychiatry. 2011 Mar-Apr;33(2):150-6. Epub 2011 Feb 21. Expert Rev Neurother. 2007 Nov;7(11 Suppl):S59-80. J Am Geriatr Soc. 2006 Oct;54(10):1550-6. BMJ. 2006 Feb 4;332(7536):259-63. Epub 2006 Jan 20. J Am Geriatr Soc. 2005 Mar;53(3):367-73. J Child Adolesc Psychopharmacol. 2005 Feb;15(1):26-37. Ann Fam Med. 2004 Nov-Dec;2(6):555-62. J Clin Psychiatry. 2004 Jul;65(7):959-65. Ann Intern Med. 2004 Jun 15;140(12):1015-24. J Am Geriatr Soc. 2003 Apr;51(4):505-14. In: Leutz W, Greenlick MR, Nonnenkamp L, editors. Linking medical care and community services: Practical models for bridging the gap. New York, NY: Springer Publishing Co; 2003. Am J Prev Med. 2001 Oct;21(3):170-6. Arch Intern Med. 1999 Dec 13-27;159(22):2673-7. Eval Program Plann. 1999 May;22(2):233-43. Author(s): Hughes GH; Cutter G; Donahue R; Friedman GD; Hulley S; Hunkeler E; Jacobs DR Jr; Liu K; Orden S; Pirie P; et al. Control Clin Trials. 1987 Dec;8(4 Suppl):68S-73S.